The next major version of the Windows Phone operating system (OS), code-named Mango, has been unveiled by Microsoft. Mango includes new features, such as Office hub support for Microsoft SkyDrive and Office 365, as well as Twitter and LinkedIn integration. The company also announced that new manufacturers - Acer, Fujitsu and ZTE - will be bringing Windows Phone handsets to market. Achim Berg, corporate vice-president, Windows Phone marketing at Microsoft, said: "Phones have not become a hub for all the ways we connect, until now. This is the first phone to bring together all the ways you connect and share in one handset." The "Threads" feature creates a single conversation thread by connecting various communication platforms, such as Facebook, text messages and e-mails. The "Groups" feature allows contacts to be grouped into a live title on the start screen. The latest version also unifies inboxes, such as Hotmail and Gmail, but keeps work e-mails separate (see video below). Berg claimed Microsoft has "reinvented" the way apps work. "On other platforms, apps live in silos and are not connected. With Mango, we have taken apps to a new level, so consumers can author, edit and collaborate with colleagues using cloud services, including Office. Developers can write apps that integrate deeply with multi-tasking," he said. Berg added: "To be successful, you need to create and provide lots of apps. It is critical for the ecosystem. We have 18,000 apps in our marketplace in less than seven months." However, Microsoft still has a long way to go to compete with Apple's 350,000 apps currently available. Mango also includes multi-tasking capability, a full version of the IE9 browser and HTML5 support, but lacks Adobe Flash support. Despite adding 500 new features to Windows Phone, the company admits it is late to the mobile OS market. Speaking at a developer conference in Japan, Microsoft CEO Steve Ballmer said: "We came to market with Windows Phone about a year later than I wish we had, shame on us." Terence Eden, mobile development specialist, says Microsoft is "playing catch-up" and its "new features", such as unified inboxes, are not particularly significant as they are already available on other platforms. Tony Cripps, principal analyst at Ovum, says Microsoft needs to do better to persuade businesses to buy and deploy its devices and new features. He believes Nokia will be crucial to Microsoft's success as the only manufacturer "completely committed" to Microsoft's OS platform. 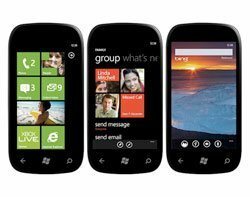 Microsoft confirmed more information would be released later this year about Nokia's devices running on Windows Phone 7 Mango. New Windows Phone devices will ship with the Mango update from the fourth quarter of 2011. A free update will be rolled out to all Windows Phone users. Web design agency Thin Martian has developed an app based on Mango for British Airways. Damian Gilbert, technical director at Thin Martian, says the code was written from scratch and back-end services were rebuilt, but all the web services and functionality were retained from BA apps on other mobile platforms. Key features include live tiles and push notifications, native feature integration, XNA and Silverlight integration (used for 3D seating), as well as linking out to Microsoft's Bing search results. "Panorama provides user interface with navigation familiar to mobile users. It is important for airlines to have information available straight away. It is simple, intuitive and provides the ability to create something visually stunning." The boarding pass uses a QR code, which is pinned to a tile on the interface. Gilbert says this shows "deep linking straight into the app". The British Airways Windows Phone Mango beta version will be available from next week.